It is a small ‘bottle-brush’ that can be held between your thumb and your fingers, or with some systems, lock into a handle for easier use. 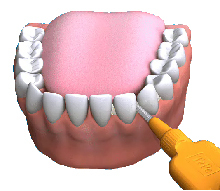 Interdental brushes are available in various sizes which enables you to choose which size is most suitable for you. You may need to use more than one size to enable you to effectively clean all spaces between your teeth. You will know that there are certain places in your mouth that are difficult to reach with your normal brush. There are also some gaps between your teeth that your toothbrush will not be able to access, especially as we get older. You need to clean between all your teeth at least once a day. This gets rid of bacteria and food particles which may build up in trapped places, damaging teeth and gums, and also eliminating bad breath from trapped food particles which decompose and cause mouth odour.